Shuttle Atlantis has been given top marks for her return to Earth via the Mission Evaluation Room (MER) landing report – normally a highly technical, emotionless review into vehicle performance. However, as Atlantis begins down processing for her retirement, her team of engineers and controllers signed off on a report which included numerous notes of pride, best wishes and farewells. Atlantis brought her crew home safely for one final time, landing on the Shuttle Landing Facility (SLF) runway 15 in the Florida pre-dawn hours, concluding a highly successful mission to provide a bufferzone for the International Space Station (ISS) during the gap between this mission and the start of commercial cargo supplies next year. She landed – as became typical for the orbiters – with no additional Mission Evaluation Room (MER) items or “funnies”, despite having just bleed off all the massive energy of launch by driving through the atmosphere as a fireball. 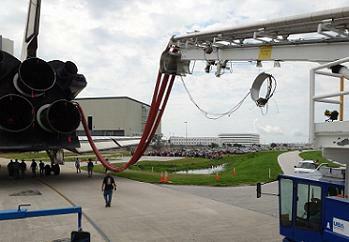 “Atlantis has safely returned home following a very successful final mission. For the final time, Florida’s east coast was rocked by the double sonic booms announcing Atlantis’ arrival. Touchdown on runway 15 occurred at 0557:00 EDT with wheel stop at 0557:54 EDT,” noted the NASA Test Director (NTD) report, which is normally highly technical and focused on engineering and flow schedules. “OMS Helium valves were configured for Deorbit burn at 202/08:45:12 GMT, and returned to post burn config at 202/08:54:13 GMT. Deorbit Burn (OMS-8) was accomplished using a dual-engine, straight-fed OMS burn. TIG (Time Of Ignition) was at 202:08:49:04.2 GMT. Cutoff was at 202:08:52:22.3 GMT resulting in a burn duration of 198.1 seconds with a delta-V of 333.1 fps. Following the burn, Commander Chris Ferguson sent down praise to the propulsion teams responsible for the OMS engines, which – as always – enjoyed an issue-free role on orbit. “There were eight (8) maneuvers (including the OMS Assist burn during ascent) which used OMS engines this flight. Six of the maneuvers were dual engine burns, one maneuver was a single Left engine burn, and one maneuver was a single Right engine burn,” added the report. As part of normal procedures, the Forward Reaction Control System (FRCS) dumped the spare fuel via four of the jets, which was timed at 202/09:07:13.5 GMT and lasted 32.64 seconds, dumping 398.2 lbs of the FRCS propellant. With all three of her Auxiliary Power Units (APUs) in action – providing power to the orbiter’s hydraulic systems – nominal performance was noted as APU 1 sprang into action, prior to APU’s 2 and 3 following suit as Atlantis began the journey home. 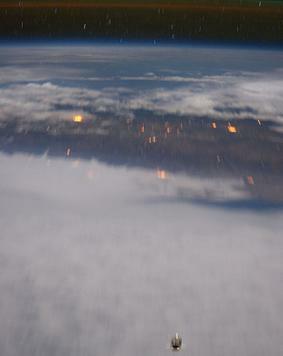 The report added all DPS (Data Processing System) hardware performed nominally during all phases of entry operations, in tandem with the Flight Software (FSW), which “performed flawless, bar typical GPC (General Purpose Computer) errors during rollout.” The GPCs, however, did not suffer from any of the issues two of the computers complained about on orbit. While the mission was extended by one day – some achievement given Atlantis is the only orbiter unable to ‘stretch’ her Power Reactant Storage and Distributation (PRSD) consumable levels via the Station-to-Station Power Transfer System (SSPTS) – she landed with plenty of margin, had the mission required moving past EOM (End Of Mission) FD 14. 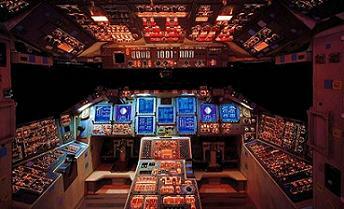 “The performance of the FC/PRSD systems during the mission was nominal,” added the MER report. “The fuel cells generated 13.6 kW and 442 amps, average, and 4159 kWh of total electrical energy during the 306.48 hour mission. 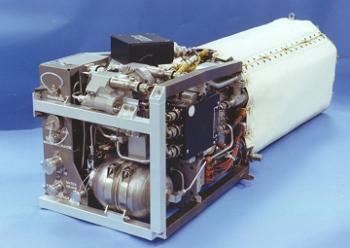 The fuel cells consumed 360 lb of hydrogen and 2856 lb of oxygen from the PRSD subsystem. Such was the performance of the three Fuel Cells, the report notes Atlantis landed with enough consumables for a three day mission extension – even via nominal power rates. With the Flight Control Surfaces (FCS) taking over from the RCS, as Atlantis started to feel the air over her airframe, her software guided her towards the Kennedy Space Center (KSC) without issue, prior to being commanded to a perfect landing on the SLF. 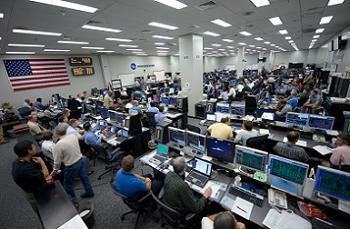 “STS-135 Landing System performance nominal based on quick look MER data retrieval. KSC Runway 15. Weather reported: No cross wind, with 1 knots tail wind. Winds at 330 deg at 1kt average with 2kt peak, landing on runway 15 which translate to a primarily tail wind condition,” the Landing Report noted. “Events as shown below (times in GMT) This data is quick look, approximate values, for information only. MGTD (Main Gear Touch Down): 202:09:56:55. 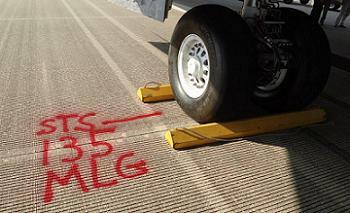 NGTD (Nose Gear Touch Down): 202:09:57:12. DC (Drag Chute) DEPLOY: 202:09:57:04. DC DISREEF: 202:09:57:10. DC JETTISON: 202:09:57:35. While the MER reports are – like most internal mission reports – focused entirely on the performance of the vehicle, the landing summary included numerous departments signing off for the final time. Some simply added a line of thanks, some joked about the last person leaving the MER to turn out the lights, but one – the the Electrical Power Distribution and Control (EPDC) console – summed up the emotion of the day. “All monitored voltage and current measurements were nominal during all phases of de-orbit prep and entry,” noted the report, prior to the addition of the personal remarks. “I have spent a lot of time over the last few days reflecting on what I would say on this my last Shuttle Shift report, and I just don’t have the words to express the pride I feel as we close this era of manned space flight. “It has truly been an honor and a privilege to work with this team both past and present. I like many of you can remember the Mercury, Gemini and Apollo days and wanting to participate in the space program when I grew up. Well, we have all lived that dream. We have shared in the triumphs and the tragedies and are the better for them. Ever the diva of the fleet, Atlantis did throw one problem at the teams whilst sat on the SLF, although the issue was very minor, related to a Valve Position Indicator (VPI). With Atlantis hooked up to her cooling and purge systems at the SLF, the slow tow back to her Orbiter Processing Facility (OPF-2) – as much as Discovery was recently evicted from OPF-2 – began, with crowds gathered to welcome the orbiter back to the hanger. Accompanied by the theme tune from Star Trek Voyager, Atlantis was parked up in front of her workforce, who waved flags and even received thanks from the STS-135 crew. Atlantis was then towed inside OPF-2, where she underwent immediate safing operations, as is standard for a returning orbiter. 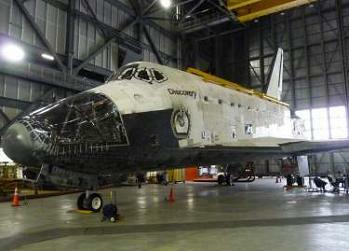 “OV-104 (OPF2): Atlantis was spotted in the OPF at 1540 EDT. Fuel Cell power down and ground power transfer was completed at 2141 EDT. Controlled venting is established and fuel cell cool down is in work,” added the NTD report on Friday. Although an order is still in place to “do no harm” to both Endeavour and Atlantis from the standpoint of down processing – via any 11th hour transition to a commercial shuttle operation in the future – the flow will mirror that of Discovery’s in her early weeks since returning from STS-133. This will include the removal of her Space Shuttle Main Engines (SSMEs) which will be placed in storage for potential use on the Space Launch System (SLS) – as much as the proposed Heavy Lift Vehicle (HLV) is still stuck in a political swamp, after two opportunities to make a public announcement – on what is a chosen configuration – were delayed by the unknown persons of power in Washington, DC. She will also lose her Forward Reaction Control System (FRCS) and OMS Pods, both of which will head to the Hypergolic Maintenance Facility (HMF) for deserving, prior to joining the game of musical OPFs, as the orbiters take it in turns to spend a vacation inside the Vehicle Assembly Building (VAB) due to ongoing work to covert OPF-3 for a commercial customer. (Images: Via L2 content and NASA.gov. Further articles on Atlantis will be produced during her down processing, driven by L2′s STS-135 Special Section which is continuing to folow the mission at MMT/MER level through to post flight IFA, surrounded by a wealth of FRR/PRCB/MER/MMT and SSP documentation/pressentations, videos, images and more.